Meet one of our favorite appetizers to serve during our dinner parties. It's vegetarian, refreshing, and creamy. The leafy thing you see here is shiso, an herb that tastes kind of like a cross between a very mild mint and basil... honestly it's difficult to describe but you've probably encountered them at a sushi restaurant. You can most likely find it at your local Japanese store. It takes 10 minutes to make and is simple yet it has a delicate flavor that anyone will enjoy! Mince the mushrooms. Sauté the mushrooms with the butter. Combine the yuzu, miso, and water until smooth. Add the miso yuzu mixture to the cooked mushrooms and mix well. 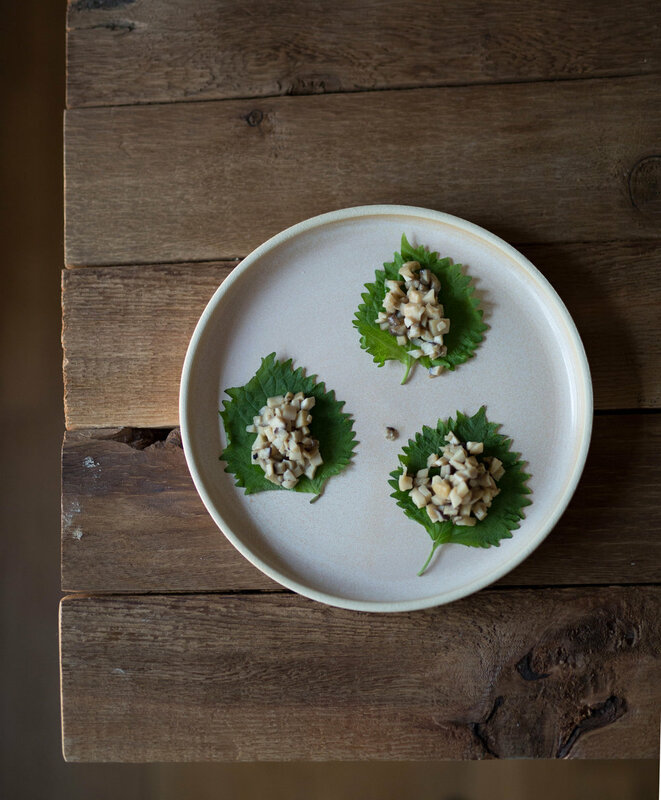 Plate on shiso leaves and serve.